While I could go on and on about these perfect little pastries, I’ll get straight to the point for you guys. 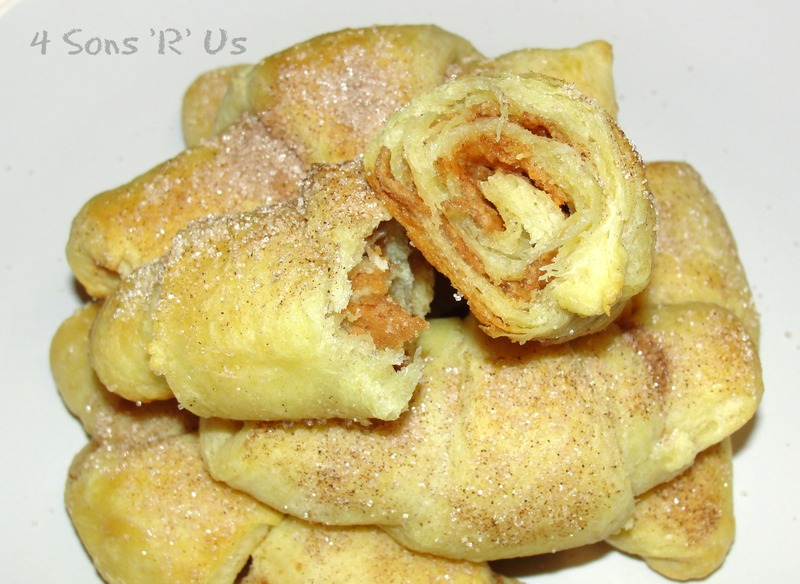 Today the sons and I are bringing you peanut butter, cinnamon, and sugar wrapped up in crescent rolls for an easy breakfast, snack, or even dessert. Be sure to sit down with a glass of milk, then pile up a gorgeous Snickerdoodle mountain of them. Eat your way to the top one crescent at a time! 1. Line a baking sheet with a silicone baking mat or parchment paper. 2. In a small bowl combine the cinnamon and sugar. 3. Unroll the crescent dough and carefully seperate into individual triangles along the perforated lines. Spread 1/2 teaspoon of peanut butter onto the top side of the crescents, starting at the wide end and leaving a little space along the edges. Sprinkle each with a pinch of cinnamon sugar. 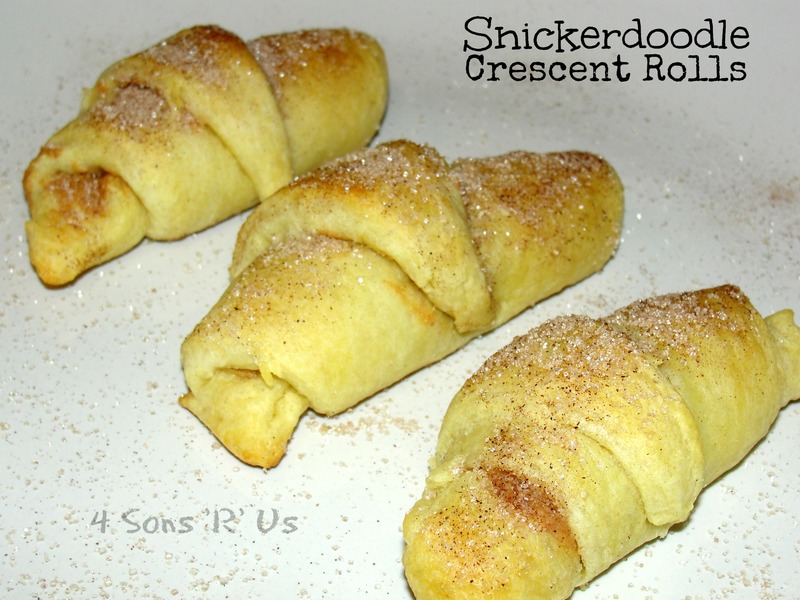 Roll into crescents. 4. Bake at 350 degrees for 8 minutes, until golden brown. While still hot carefully roll them in the cinnamon and sugar. Roll again after they’ve cooled. 5. These can be stored in an airtight container for up to 3 days. Can also be frozen for up to one month. Then you’ve got a quick, on-the-go breakfast or snack for busy days! Posted in Recipes, Sous Chef Sundays and tagged breakfast, crescent rolls, dessert, peanut butter, snack. Bookmark the permalink. 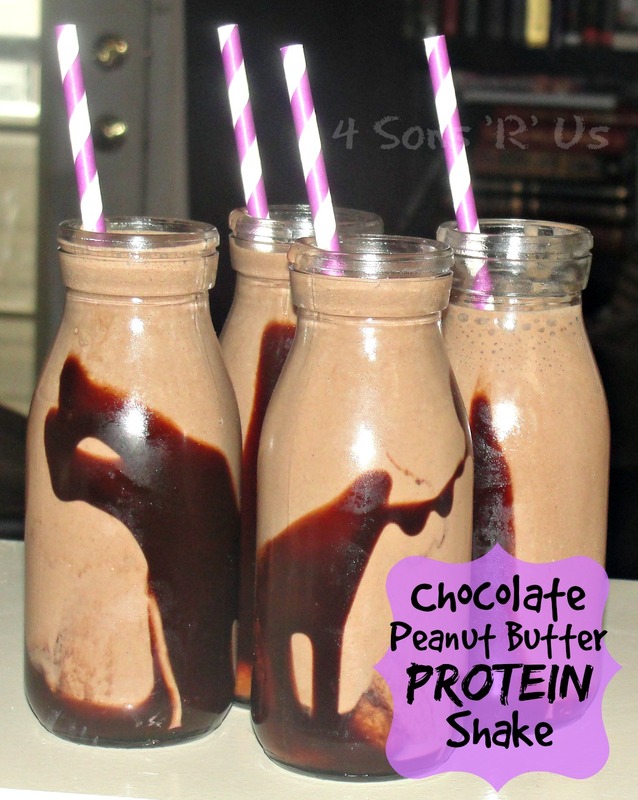 Posted in Recipes and tagged chocolate, dessert, peanut butter, smoothie, snack. Bookmark the permalink. Short on time? Looking for an alternative type of lunch? Trying to appeal to your pickier little foodies? These do the trick. 1. Put on pot of boiling water for pasta. Cook the fettuccine to al dente. 2. While the pasta is cooking, whisk together orange juice, peanut butter, soy sauce, vinegar, sugar, chili sauce and lime if you are using it. 4. Pour the sauce over noodles, and stir to coat, continue folding and mixing the pasta over heat for about a minute. 5. Serve with a splash of soy or Ponzu sauce, or wedges of lime. Have a larger family? Feeding a crowd? Making for dinner rather than lunch? No worries. 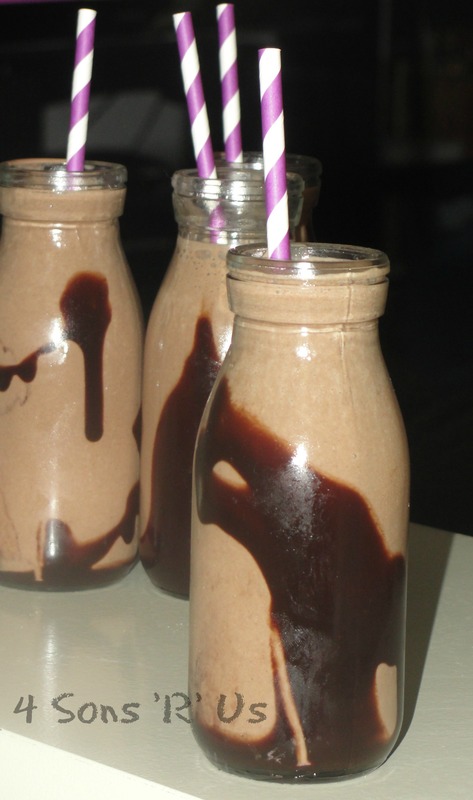 The recipe easily doubles to accommodate your needs. 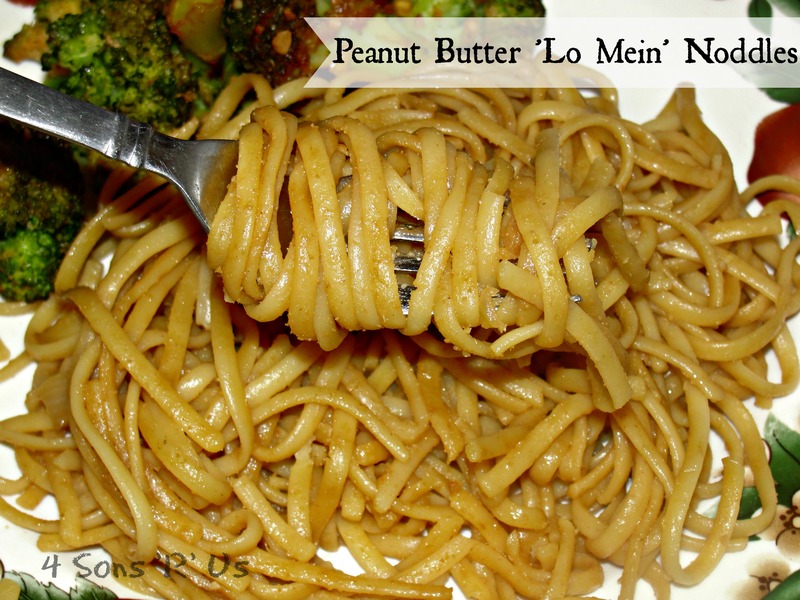 Posted in Recipes and tagged dinner, kid friendly, lo mein, lunch, orange juice, pasta, peanut butter, peanut butter noodles. Bookmark the permalink. What is it about the combination of pb & j that kids loved so much. Seriously? I remember eating peanut butter & jelly sandwiches every chance I got as as kid. Any meal, any time. I didn’t care. I’m pretty sure I o.d.ed on it I ate it so much. As an adult the thought of eating it makes me feel slightly ill. Yep, definitely o.d.ed on the two as a kid. Thankfully, my own kids seem to have managed to avoid the same fate. They beg for the stuff. I’ve caught all of them at least once, ok maybe twice, hiding in the pantry and eating peanut butter by the spoonful out of the jar. They love it on celery sticks. Apple slices? You bet! Even tortillas. My crazy kids use peanut butter like it’s a condiment. With that in mind, we decided to get creative with our next popcorn experiment. 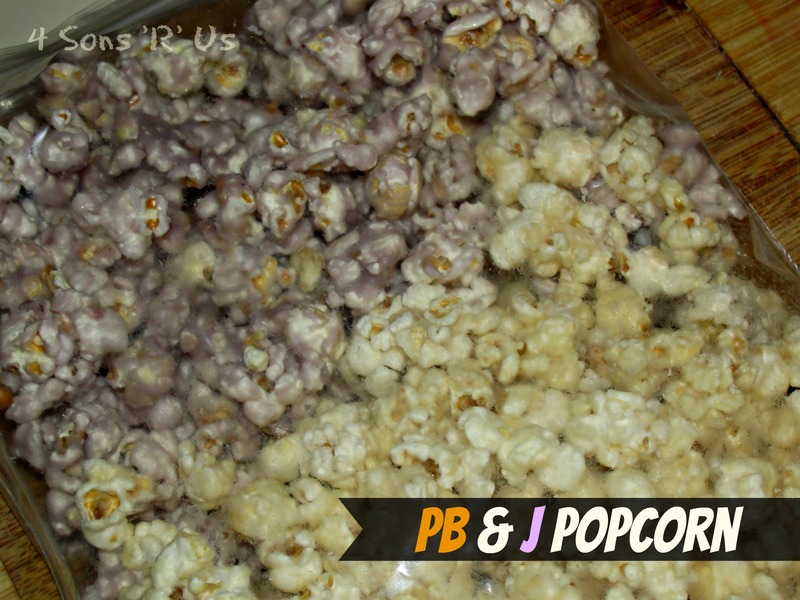 I hit the web and found this simple, but totally awesome, looking recipe for Peanut Butter & Jelly popcorn. The finished product knocked their little socks off. I’m talking toe-curlingly delicious level. It was snack time and dessert all rolled into one. Even I enjoyed the stuff. Fix a batch for your own pb & j fans and rock their world. 1. Divide Popcorn as evenly as possible into two separate bowls. 2. Over medium low heat on the stove top, melt 1/2 cup white chocolate with 1 tbsp. peanut butter. Stir until smooth. Pour over 1 bowl of the popcorn. Use a rubber spatula to mix well and coat thoroughly. Spread out on a silicon mat or parchment paper to let cool. 3. Meanwhile, melt the remaining 1/2 cup white chocolate with 1 1/2 tbsp grape jelly over medium low heat on the stove top. Stir until smooth. Pour over the other bowl of popcorn, and stir with rubber spatula to coat well. Spread out on silicon mat or parchment paper to let cool. 4. Once both batches of popcorn are cooled enough that the coatings are set, mix them both together in a bowl and serve! Posted in Recipes and tagged gourmet popcorn, jelly, movie night, peanut butter, Peanut Butter & Jelly, popcorn, snack. Bookmark the permalink.